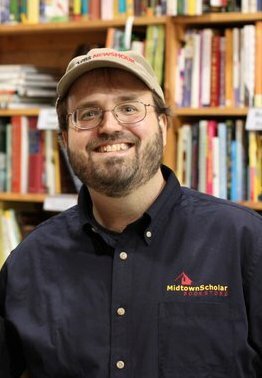 Bookseller Elected Mayor of Harrisburg, Pa.
Last night, Eric Papenfuse, owner of the Midtown Scholar bookstore, was elected mayor of Harrisburg, Pa., by a vote of 3,604 to 2,312, according to WHTM-TV. He becomes one of that rare breed of bookseller-mayors, whose ranks have included Neal Coonerty of Bookshop Santa Cruz in California and Richard Howorth of Square Books in Oxford, Miss. At a celebration at the store, Papenfuse said, "No one individual can do this job. It's going to require tremendous amounts of support. It's going to require support from those who voted for my opponents. It's going to require assembling a whole new staff of individuals to work for the City of Harrisburg. We have openings galore and we're going to need to work very hard to fill them with the best and the brightest." Papenfuse had defeated incumbent mayor Linda Thompson in the Democratic primary in May. 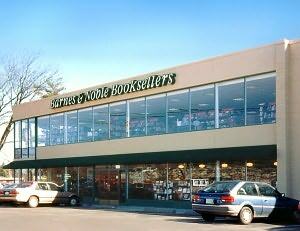 The Barnes & Noble bookstore in Chestnut Hill, Mass., will close by the end of the year. David Deason, B&N v-p of development, told the Newton Patch that the lease is expiring at the end of January, but the store is closing in December. "We worked to have the lease extended but were unable to come to an acceptable agreement with the landlord. We will continue to serve our customers at the nearby Prudential Center store." 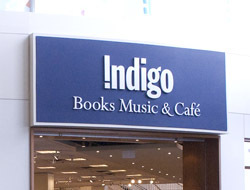 In the second quarter ended September 28, revenue at Indigo Books & Music fell 3.3%, to $179.4 million, and the net loss increased 152.5%, to $10.1 million. The company also announced that after this year, its quarterly dividend is being suspended to help pay for a range of development and strategic growth initiatives. The company said that revenue fell mainly because of "the phenomenal success last year of the Fifty Shades and Hunger Games trilogies, the much slowed but continuing growth of e-reading, and the company operating nine fewer stores." Excluding the trilogies, sales rose 0.3% in the quarter, in large part because of double-digit growth in lifestyle, paper and toy sales. Online sales rose 3.3%, to $18.7 million. At Indigo and Chapters superstores open at least a year, sales fell 2.8%, while sales at Coles and IndigoSpirit small-format stores open at least a year were down 8.2%. Indigo blamed the increased loss in part on lower book sales, but "more significantly" on "intentionally higher operating, selling and administrative expenses, compared to last year, associated with its transformational initiatives." These initiatives included "marketing to engage Canadian customers with its new categories, in advancing its digital capabilities, in creating merchandising within its existing superstores to highlight the expanded product mix, and in improving several aspects of its general merchandise capabilities." Among other changes, at the end of the quarter, Indigo had opened its first 12 !ndigotech shops--in-store boutiques that feature design-inspired lifestyle electronics and accessories--and plans to open another 20 before the holiday season. The company also will open American Girl "shop in shops" in some Indigo stores. Indigo also plans on "major store renovations, increased investment in its proprietary product development capability, and increased digital investment to fully bring to life its booklovers lifestyle store concept." Although Indigo approved a quarterly dividend of 11 cents per share to be paid December 3, the company said it is suspending dividends beyond then because of its many "planned increased expenditures to support the company's strategic development and growth." It stated that "the current dividend program was initiated at a time of significant earnings and very much prior to the advent and impact of the digital reading revolution." 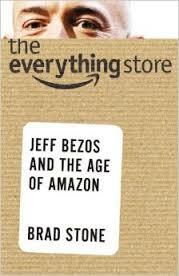 The reviews on Amazon of The Everything Store: Jeff Bezos and the Age of Amazon by Brad Stone (Little, Brown) continue to pour in. Following a long, withering review posted two days ago by MacKenzie Bezos, Jeff Bezos's wife, Shel Kaphan, an Amazon executive during the first five years of the company's existence, chimed in with his own four-star review. 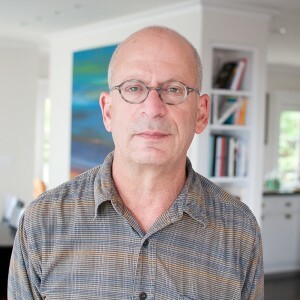 As AllThingsD reported, in the review, "Kaphan said he wasn't planning to review Stone's work, but decided to after reading the negative review by MacKenzie Bezos and mixed reviews by current Amazon exec Jonathan Leblang and former Amazon exec Rick Dalzell, which are now the first three reviews readers see when they visit the landing page for Stone's book." 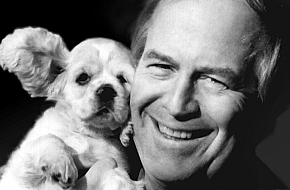 Kaphan wrote: "I spent considerably more time in the Amazon work environment during those years than MacKenzie Bezos did. By and large I found Mr. Stone's treatment of that which I know firsthand to be accurate--at least as accurate as it is possible to be at this great a remove, and with no contemporaneous documentation of the early chaotic days or access to certain of the principals." Kaphan concluded: "There is plenty more that could be written about, and maybe someday somebody will. If and when that happens, I can only hope it is also 'unauthorized' and not sanitized by a corporate PR department, and that some real investigative journalism is done, like Mr. Stone did here." AllThingsD noted, too, that the negative reviews by current Amazon family likely have helped boost the book's sales: The Everything Store is ranked #82 in sales this morning on Amazon. Actor and voice artist Oliver Wyman is appearing at the Golden Notebook in Woodstock, N.Y., on Saturday, December 7, to entertain youngsters with a reading from Kate DiCamillo's Flora & Ulysses: The Illuminated Adventures. Along with signings by several local children's book authors, the performance is part of the store's celebration of the fourth annual Take Your Child to a Bookstore Day. The Golden Notebook, which is celebrating the event for the first time, is joining more than 500 bookstores in the U.S., Canada, England, Germany and Australia participating in Take Your Child to a Bookstore Day. "We have a wonderful children's and YA section and have been slowly moving toward more in-store kids programming," explained owner Jackie Kellachan. "I see this as a great opportunity to promote indie bookstores as well as to create a fun event." She heard about Take Your Child to a Bookstore Day from Jenny Milchman, a novelist, mother of two and founder of the event, who recently moved to the Woodstock area. 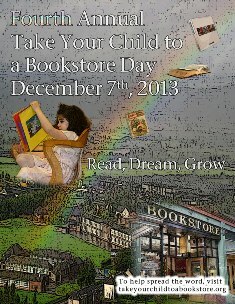 The mission of the holiday is to introduce children to bookstores and everything they have to offer, from the benefits of being in an environment that's visually, intellectually and socially stimulating to the sense of investment and empowerment that comes with selecting and acquiring a new book. It's also an opportunity for kids to interact with booksellers, not only to receive personal reading recommendations, just like grown-ups do, but for the chance to spend time with role models for whom books are the center of their day-to-day lives. Participating booksellers can add their store to the interactive map at takeyourchildtoabookstore.org, as well as get banners and pins to display on websites and blogs or download and print a promotional poster. "There are many wonderful authors and other people who are doing kids' literacy campaigns," Milchman said. "I applaud them and we'd love to tie in to that, but Take Your Child to a Bookstore Day is different. It's really about the fact that there is a physical immersion to reading a book and there is a physical immersion to choosing that book, or there can be, and when there is it becomes almost a completely different experience. It says something to a child in a way he'll never get if he just sees mom order a book online." Earlier this year Milchman spent seven months on the road visiting bookstores to promote her debut suspense novel, Cover of Snow, along with Take Your Child to a Bookstore Day. "All across the country I saw the most touching encounters where a bookseller would reach down her hand and a child would take it and be led and leave that day with something that could change their life," she said. "To have that potential in each moment is a really big part of the holiday." Milchman and a board of directors she assembled are close to establishing Take Your Child to a Bookstore Day as a nonprofit, which will allow it to raise funds and apply for public and private grants. Plans include partnering with schools in at-risk communities, to conduct field trips on the holiday for kids who might not otherwise be able to participate. Along with Milchman, board members are Paul Maguire, who worked on the New York Stock Exchange and is the author of Professor Atlas and the Summoning Dagger and other children's books; Todd G. Monahan, senior attorney, Office of the Professions, New York State Department of Education; and Beth Miller, who has more than two decades of experience in the nonprofit sector. 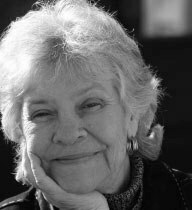 Miller's fond memories of childhood excursions to bookstores with her father and three siblings inspired her to join the board. "Every child should have that opportunity to walk into an independent bookstore and visit another world, one where they are free to imagine, learn and escape into a nurturing and safe environment," she said. Support from the American Booksellers Association has boosted awareness of Take Your Child to a Bookstore Day as have social media outreach, word of mouth and Milchman's own grass roots efforts. A stop on her cross-country tour was at Mystery to Me in Madison, Wis., where she was the first author ever to read at the newly opened store. While there she talked up Take Your Child to a Bookstore Day, which the shop will celebrate with storytelling and hands-on activities. World-renowned chef and restaurateur Charlie Trotter, who was also the author of numerous cookbooks, died yesterday, the Chicago Tribune reported. He was 54. Image of the Day: Oldest Living U.S. Bookseller? 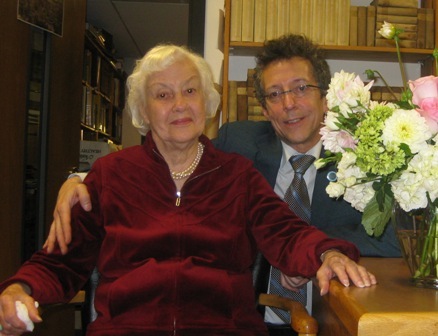 Weller Book Works, Salt Lake City, Utah, devoted its Rare Book Collectors' Salon last month to Lila Weller, the family matriarch, in honor of her 98th birthday. She still works several hours a week in Weller's Rare Book Room, collating rare books and manuscripts. The staff researched other longtime booksellers actively working in the trade and were unable to find anyone older in the U.S.
"When it was time to schedule the October Salon and I saw it would fall on my Mom's birthday, I knew she would be the perfect person to provide the Collectors' Offering," said co-owner Tony Weller, referring to the 30-minute talk given each month at the salon by a person in the community with a particular passion or expertise to share. "She has witnessed the evolution of this old bookstore since the years right after World War II until the present. No one in our family has a longer view of the bookstore. At first she declined but with a little persuasion from me, she agreed to tell our guests stories from her long experience." Describing her as "an amazing woman," co-owner Catherine Weller added. "We're lucky we still have her around, especially when I remember she's 98, which is hard to do. There are days when I believe she'll outlive us all." "Ordering online or downloading through your e-reader may be convenient, but nothing compares to the magic of a real bookstore," Buzzfeed noted in showcasing "10 lovable things about brick-and-mortar bookstores." We're sure you can add to the list. Effective January 1, Consortium Book Sales & Distribution will distribute Nicholas Brealey Publishing in the U.S. and Canada. Distribution has been handled by National Book Network. With offices in Boston and London, Nicholas Brealey Publishing publishes in the areas of popular psychology and self-help, coaching and leadership, business and economics, as well as travel narratives and crossing cultures. The company's spring list includes The Brain Sell: When Science Meets Shopping by Dr. David Lewis, The 80/20 Principle and 92 Other Powerful Laws of Nature by Richard Koch, Clickology by Graham Jones, The Trouble with Europe by Roger Bootle, Slow Train to Switzerland by Diccon Bewes, The Kama Sutra Diaries by Sally Howard, and a revised edition of Watching the English by Kate Fox. Arcas Publishing, founded this year, which publishes books to help readers lead more fulfilling lives. Cardinal, Montreal, Canada, which publishes cookbooks, literature and health and wellness guides, including its World's 60 Best cookbook series. The Do Book Company, launched in the U.K this year, publishes inspirational how to pocket guides, including Do Birth, Do Grow, Do Story, Do Disrupt and Do Improvise. Le French Book, which publishes translations of French mysteries, thrillers, novels and short stories. Post Hill Press, which publishes fiction and nonfiction and whose newest authors are Tom Abrahams, Keni Thomas and Oliver North. Spring House Press, a new publisher that specializes in cooking and beverages, crafts and hobbies, house and home, and health and wellness titles. Third World Press, one of the largest African American-owned presses in the U.S., which publishes progressive and political works of fiction and nonfiction, poetry and cross-genre work. Happy Mutant Baby Pills by Jerry Stahl (Harper Perennial), a trailer that features cameos from Ben Stiller, Michael C. Hall, Jason Schwartzman and Flea. Tomorrow morning on Good Morning America: Buddy Valastro, author of Family Celebrations with the Cake Boss: Recipes for Get-Togethers Throughout the Year (Atria, $30, 9781451674330). He will also appear on Rachael Ray. Tomorrow morning on Fox & Friends: Patrick Robinson, author of Honor and Betrayal: The Untold Story of the Navy SEALs Who Captured the 'Butcher of Fallujah'--and the Shameful Ordeal They Later Endured (Da Capo, $26.99, 9780306823084). Tomorrow on KCRW's Bookworm: Alice McDermott, author of Someone (Farrar, Straus and Giroux, $25, 9780374281090). As the show put it: "Alice McDermott once felt a fear that her new novel, Someone, would be seen as just another of her perfect Irish American novels. Instead it leaps from the page, provoking bookworm Michael Silverblatt to proclaim, 'I loved this book in every way a book can be loved.' We follow the path from prosaic detail to full-hearted radiance." Tomorrow on CNN's Situation Room with Wolf Blitzer: Mark Halperin, co-author of Double Down: Game Change 2012 (Penguin Press, $29.95, 9781594204401). Tomorrow on the Rachel Maddow Show: Congressman John Lewis, co-author of March Book 1 (Top Shelf Productions, $14.95, 9781603093002). Tomorrow night on the Colbert Report: Daniel Lieberman, author of The Story of the Human Body: Evolution, Health, and Disease (Pantheon, $27.95, 9780307379412). A first image is now available of Mia Wasikowska as Madame Bovary in the film adaptation of Flaubert's classic novel. The movie, which is directed by Sophie Barthes (Cold Souls), also stars Ezra Miller, Paul Giamatti, Rhys Ifans and Henry Lloyd-Hughes. Entertainment Weekly noted that in the photo, Wasikowska "wears the 1,000-yard stare of a woman slowly suffocating in her life. The movie is being filmed in Normandy, France, where the novel is set." Initial images have also been released for another classic novel adaptation--Thomas Hardy's Far from the Madding Crowd. Indiewire reported that production has begun on the "star-studded" project, directed by Thomas Vinterberg (The Celebration, The Hunt), with a cast that includes Carey Mulligan, Matthias Schoenaerts, Juno Temple, Michael Sheen and Tom Sturridge. Lucy Hughes-Hallett won the £20,000 (about US$31,954) Samuel Johnson Prize for Nonfiction for her biography The Pike: Gabriele d'Annunzio--Poet, Seducer & Preacher of War. Chair of judges Martin Rees said readers of the book "will surely admire Lucy Hughes-Hallett's writing, and her intricate crafting of the narrative. Her original experimentation with form transcends the conventions of biography. And they will be transfixed by her vivid portrayal of D'Annunzio--how this repellent egotist quickly gained literary celebrity--and how, thereafter, his incendiary oratory and foolhardy bravery influenced Italy's involvement in World War I and the subsequent rise of Mussolini. The book shows how fascism rose partly as a perversion of nationalism--a trend still sadly relevant in today's world." When something inconceivable happens, such as the tragic event at Sandy Hook Elementary last December, there's an impulse to do something. Patricia MacLachlan and Steven Kellogg's response was to do what they do best: write and paint. Their collaboration evolved into Snowflakes Fall, just published by Random House. "All I have is words," MacLachlan told her children--who now have children of their own--following the tragedy. "Then use words," said her son John. For Steven Kellogg, the connection was very deep. He raised his children in Newtown, Conn., along the winding river for which the village of Sandy Hook is named. He lived there for 30 years and created more than 100 children's books in the red farmhouse pictured in his illustrations for Snowflakes Fall. His serene images blanketed in snow feature the library, once home to Mary Elizabeth Hawley, a benefactor to the town, who also left money for the school and other public buildings. The flagpole Kellogg depicts, situated in front of the town's meetinghouse, was once the mast of a 19th-century clipper ship. Kellogg and MacLachlan create a town with a long history, and a cast of child characters firmly rooted in the present. 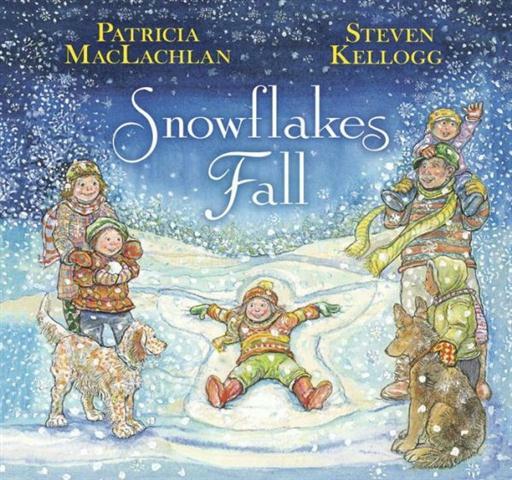 Their book is a testament to the healing that comes with the passage of seasons, and of a child's experience of living moment to moment, like their characters' dog companions, also featured in Kellogg's images. "After the flowers are gone/ Snowflakes fall./ Flake/ After flake/ After flake/ Each one a pattern/ All its own--/ No two the same--/ All beautiful." These lines begin the picture book; like any good poem, the lines allow young readers to see the snow angels as the spirits of the children lost too soon that day, and to glide over them if they do not wish to see the allusion. "It is Sandy Hook Elementary School's emblem, the snowflake," MacLachlan explained. "Children from all over the world sent snowflakes [to Sandy Hook]. Words came like snowflakes, word after word." In concert with the book's publication, Random House Children's Books will make a donation to the Sandy Hook School Support Fund, overseen by the Newtown-Sandy Hook Community Foundation; the Where Angels Play Foundation, in support of the Sandy Ground Project (whose goal is to build 26 playgrounds in the tri-state area to honor the lives of those lost at Sandy Hook Elementary, directed by the New Jersey State Firefighters' Mutual Benevolent Association); and a donation of 25,000 new books to the national literacy organization First Book in honor of the community of Sandy Hook and Newtown, Conn.
Roy Choi was born in Seoul, Korea, and raised in Los Angeles, where he still lives. He graduated from the Culinary Institute of America and went on to cook at the internationally acclaimed Le Bernardin in New York. He was named Best New Chef by Food and Wine in 2010. 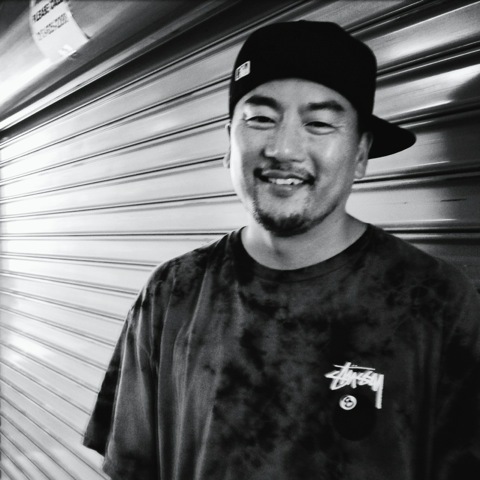 Choi is the co-owner, co-founder and chef of Kogi BBQ, as well as the restaurants Chego!, A-Frame, Sunny Spot and POT. His book, L.A. Son: My Life, My City, My Food was published yesterday by Anthony Bourdain/Ecco. Johnny Cash: The Life by Robert Hilburn. I read books that fall into my life by chance, it's the same way I approach music. I got lucky to do a Southern California Independent Booksellers Association event promoting the book, and Robert Hilburn was at the same event. I can't put it down. The Giving Tree by Shel Silverstein, Charlie and the Chocolate Factory by Roald Dahl, Lord of the Rings by J.R.R. Tolkien and Superfudge by Judy Blume. The Giving Tree has been my philosophy of life throughout my whole life. I knew I was a giver since a young age and this book helped me see I wasn't weird in that. I was the tree. That's hard for me to remember because I don't have a good memory like that. But I like Elmore Leonard, James Baldwin, Maya Angelou, Jack Kerouac and Junot Diaz. If Beale Street Could Talk by James Baldwin. I could feel the pain and racism, which mirrors a lot of what I've been through in life. On the Road by Jack Kerouac and The Autobiography of Malcolm X by Malcolm X and Alex Haley. Freedom and the fight for freedom. Two parallels that guide me today. F***, I don't remember that kind of stuff... too much weed in my life. "To be or not to be" is the only thing I remember from anything... ha! Kitchen Confidential by Anthony Bourdain. I never read something so visceral in my life that hit me in the gut like KC. Everything else I had read was from a time way in some past; this felt like the moment and like a life I wanted to live. I'm sure it would feel the same now, that's why I want to read it again for the first time. As she did with her succinct, lyrical picture-book biographies of Dr. Martin Luther King, Jr., and Eleanor Roosevelt (Martin's Big Words; Eleanor, Quiet No More), Doreen Rappaport here pays tribute to the legacy of Teddy Roosevelt (1858-1919), the 26th president of the United States. Children will be inspired by the story of how "Teedie" grew from an asthmatic child prone to fevers into a strong leader of conviction. With an abundance of quotes taken from Roosevelt's autobiography, speeches and letters (the author attributes all quotes in her acknowledgments), Rappaport selects just the right one at each crossroads of the man's life to convey his love of books, writing, family and country. She draws a direct line from the sickly child who read profusely about hippopotamuses and zebras on the African plains, about Valley Forge soldiers, Davy Crockett and Daniel Boone, to the man who would spearhead a conservation movement and lead the Rough Riders into the Spanish Civil War. Artist C.F. Payne conveys Teddy's seriousness of purpose, as when he's climbing mountains to gain strength ("You have the mind, but not the body. 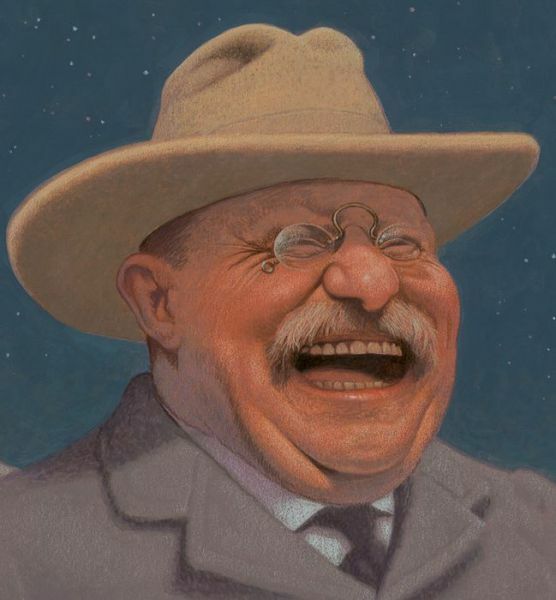 You must make your body," Teddy's father told him), as well as his sense of humor, in a scene where Teddy's giant tortoise terrifies his landlady in college. The artist creates an especially poignant image of Roosevelt, grief-stricken after the death of his first wife, Alice, finding solace in the Dakota Territory. Shelf Talker: This succinct, inspiring picture-book biography of Teddy Roosevelt portrays a sickly child who grew into a man strong enough to fight for his big ideas.